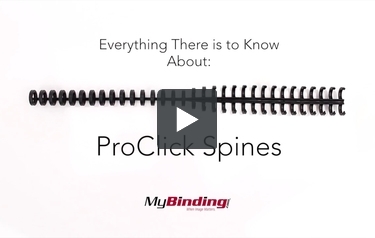 We have lots of ProClick spines available from GBC on our site. You can choose from one of four colors, such as black, white, navy blue, and frosted. And we have three different sizes for the first three colors, and two for the frosted spines. And each size has three different package options; you can get 10, 25, or 100 spines per box for black and white spines, and you can get the navy blue or frosted spines in 25 or 100 pack. ProClick binding styles are a professional looking binding option, with the added bonus of easy editing. Just zip open and snap shut-editing on the go has never been easier! Sizes available are 1/2" or 5/8" both are 32 ring.